Trailer Trash Tragedy — Who, at the totally unfashionable Annual Trailer Park Smorgasbord Dinner and Dance party, murdered of one of the residents and created this trailer trash tragedy? Deadly Ever After — What happens when “happily ever after” becomes “deadly ever after”? Find out in this mystery party game in which famous literary characters solve a murder! A Murder in Margaritaville — Set in the sunny and laid-back Florida Keys in the 80’s, someone gets wasted in Margaritaville, and everyone’s a suspect … so come join the fun! Murder in the Wild West — Join the guests at Lil’s Last Chance Saloon in Dodgy City for an evening of fun and laughter. Now that Marshall T. Pott has cleaned up the town what could go wrong? Death of a Teen Idol — Everyone loves the teen pop-star singing sensation. She’s got everything a girl could wish for … except now she’s just been murdered. Obviously, she wasn’t loved by everyone after all. 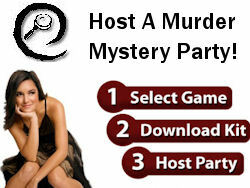 Masquerade Murder Mayhem — A murder mystery masquerade party game for large groups and corporate events. It’s a great choice for team building activities and holiday parties. A Medieval Murder — With scripted dialog to enhance the rounds, this murder mystery combines the fun of a medieval night with a murder most horrid! Back to the Eighties — Get ready for some teased-up hair and Member’s Only jackets mixed with a fun ’80s story line and trivia challenges – guests can totally chill out and have a blast unless someone totally gets murdered! Desperate Neighbors — Something is brewing on Mysteria Lane, and the coolest party of the year includes trivia, dancing and of course, a murder! Death of a Dancer — Taking place in the dance department at the City Performing Arts School the day of the school’s final performance, this is a fun game for teen (or almost) teenage girls at a birthday or sleepover party. That’s a nice variety of themes, and you’d be hard-pressed to find better options for your next dinner party entertainment. Also, with the Christmas and New Years holidays coming up, check out these festive party games: A Holiday Murder, I’m Dreaming of a Red Christmas, The Christmas Crimes, and The Night Before Christmas. All the games are really easy to set up and play. You’ll be provided access to your very own interactive online murder mystery site that is filled with party information, clues, photos, character biographies and more. Whether you are planning an intimate dinner party or an entire mystery weekend for hundreds, you’ll have everything you need to host the perfect murder mystery party. You may also want to check out Board Game Central‘s selection of Christmas Board Games.